Topaz color. Aromas and flavors of green strawberry, wet fruit, and strawberry sorbet with a satiny, vibrant, dryish light body and a polished, quick finish with no oak flavor. A very crisp rose to take the edge off of summer heat. Bottom Line: A very crisp rose to take the edge off of summer heat. 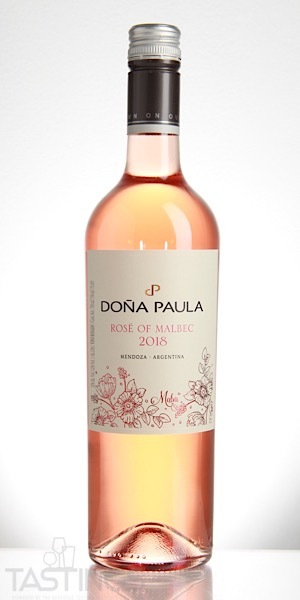 Doña Paula 2018 Rosé, Malbec, Mendoza rating was calculated by tastings.com to be 84 points out of 100 on 8/23/2018. Please note that MSRP may have changed since the date of our review.